At Montgomery & Associates, our expertise is groundwater. For more than 30 years, we have helped our clients develop, protect, and sustain this limited resource in arid regions of the western US and South America. In recent years, as local groundwater supplies are stretched, our clients’ approach to water planning is expanding to all types of water resources. The water industry is beginning to manage all local water resources in a manner that supports a sustainable and vibrant community. On the water side, the focus is broadening from the mission to simply deliver reliable and clean drinking water to include water conservation, rainwater harvesting, and non-potable uses. On the wastewater side, there is a shift from out-of-sight wastewater treatment and disposal to reuse of effluent for environmental and human needs. As part of this evolution, rainwater and stormwater runoff, particularly in urbanized areas, are becoming more important parts of local water resource portfolios. 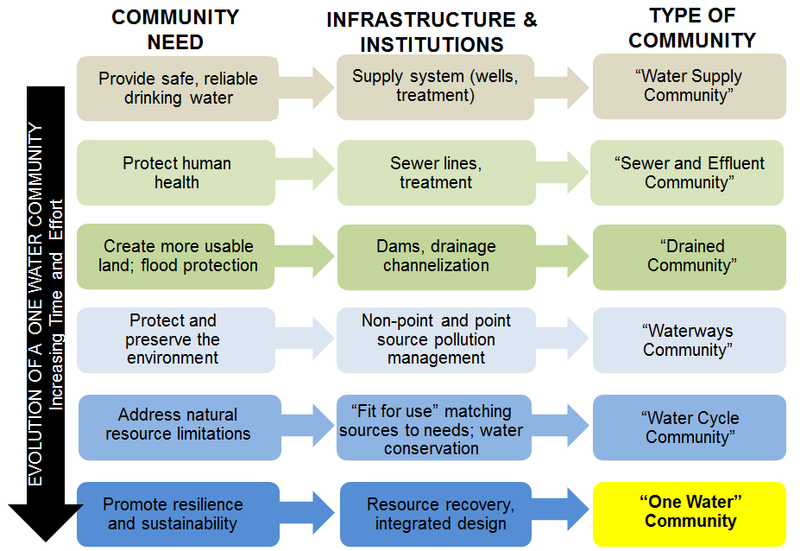 The term “One Water” describes this comprehensive and long-term approach to community-based water management. One Water considers “the urban water cycle as a single integrated system”. A One Water approach recognizes all urban water supplies as resources – surface water, groundwater, stormwater, and wastewater. These interconnected resources are managed for their combined impacts on flooding, water quality, and watercourses. This comprehensive management of all water supplies, considering multiple end uses, improves the overall quality of life in a community by benefitting both the environment and the economy. California’s Integrated Water Management (IWM) process similarly recognizes the importance of local water supplies for public safety as well as supporting the local economy and environment. The state’s IWM planning guide acknowledges that local water managers working in a collaborative, open, and transparent manner are best-suited to manage their own water resources. Successful planning requires a comprehensive look at how all water supplies can impact and be affected by drought, flooding, and climate change while also recognizing the importance of water quality, environment, infrastructure, economy, recreation, and cultural needs. I first heard about “One Water” as a water planning strategy from a 2015 article in the AWWA Journal. Stating that “our concept of source water needs to change,” the author noted that “…for too long we have not been creative about how we manage stormwater, we neglected the opportunity to recharge local groundwater”, and have failed to account for the fact that “… in some water-short areas, wastewater is the only reliable resource”. About that time, Montgomery & Associates began working with The Nature Conservancy’s Arizona Chapter and the Cochise Conservation and Recharge Network (CCRN) to implement projects using local water supplies to support community goals. This group’s work with Cochise County and the City of Sierra Vista, Arizona is an example of a One Water approach to water planning. Sierra Vista is a community of 50,000 people in Cochise County in southeastern Arizona. The region has two unique assets: the San Pedro River that flows north from Mexico, and Fort Huachuca, a U.S. Army base that is a major driver of Sierra Vista’s economy. There are both environmental and economic reasons to protect the river. The river and its unique riparian corridor are home to several plants and animals that are protected under the federal Endangered Species Act and are the basis for ecotourism in the area. The continued operation of the Fort requires compliance with a Biological Opinion for protection of these riparian species. For these reasons, the operation of Fort and the local economy are directly linked to the health of the river. Water planning by the CCRN and Sierra Vista employs a One Water strategy by aiming to match all available local water supplies to their highest value use, including protection of San Pedro River flows. The group is undertaking a first-of-its-kind strategy in Arizona to construct several near-river recharge projects to support the environment and economy. The projects will recharge effluent and urban runoff and increase groundwater levels near the river and enhance and extend flows in the river. Existing projects in the network include the City of Sierra Vista’s effluent recharge facility and a county flood control and recharge demonstration project. One Water means an “all of the above” approach to local water supplies and science-based planning. To be successful, it also requires “out-of-the-box” solutions and turning challenges – such as water rights claims and endangered species issues – into opportunities. Involving local partners who not only provide leadership but can also allocate resources is also important. This is the case with the CCRN, which includes the mayor of Sierra Vista and a Cochise County supervisor (both elected officials), as well as city managers and a county administrator. One Water recognizes that a community’s groundwater, surface water, effluent, and urban stormwater can all help meet economic, environmental, and human needs and lead to a more resilient and sustainable community. The figure below describes the evolution into a One Water Community. 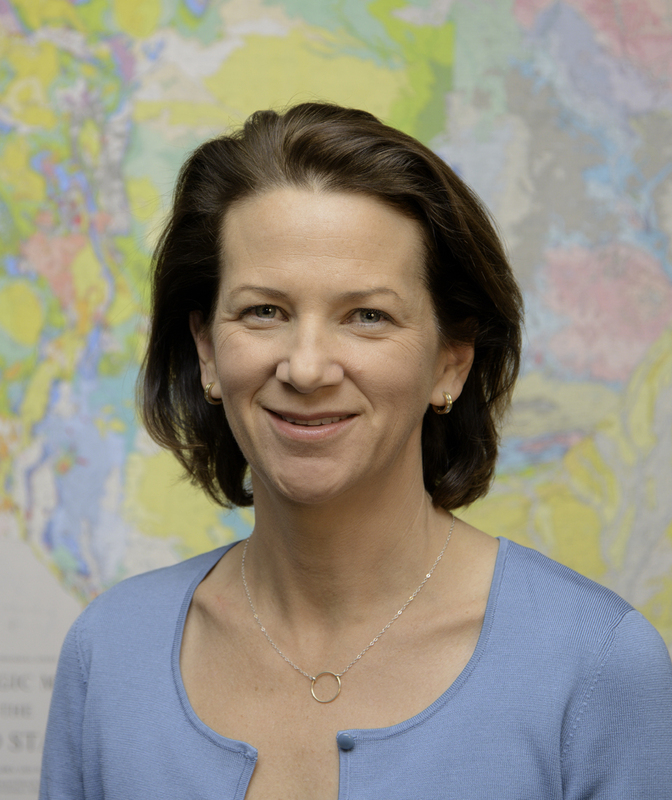 Juliet McKenna co-founded M&A’s Water Resource Planning group in 2007, and has over 20 years experience as a hydrogeologist and water planner. She provides hydrogeologic, water rights, and planning support for municipalities, irrigation districts, tribal groups, and environmental organizations. Juliet prepares M&A’s monthly Arizona Water News Update that tracks issues and trends affecting the price and availability of water in the west.